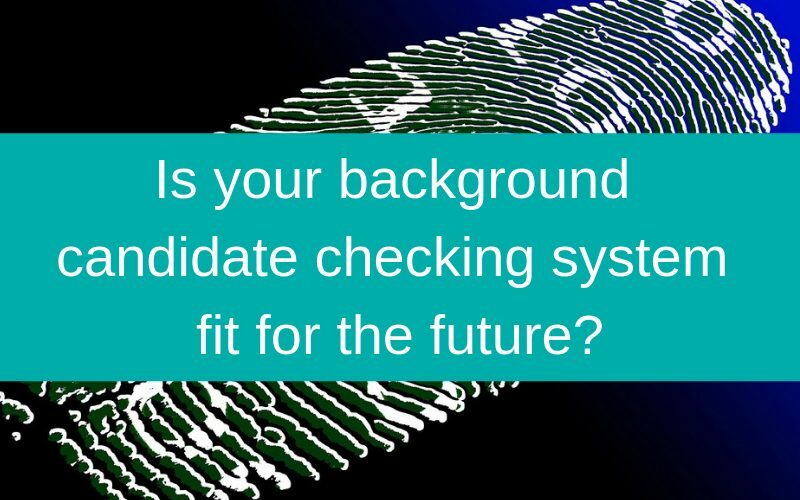 Home » News and Insights » Is your background candidate checking system fit for the future? This week, EU citizens working at 12 NHS Trusts in the North West of England will start piloting the new settlement-status digital coding application. This marks a historic step forward in the introduction of digital identification within the background screening process. So, what is the likely impact on HR Managers and what are the other factors calling for a more streamlined background checking system to expedite the recruitment process? Crucially, how do you make sure you don’t get left behind? As any HR Manager will attest, reference checking is vital because it protects your organisation’s people, assets, and brand reputation. It is the only aspect of the recruitment process that requires the input and substantiation of a third party. It is also the element that is most prone to human error. With candidates in high demand, the probability of hiring someone who has been rather ‘creative’ with their CV and at interview, is high. The 2017 Recruitment Risk Index research by online reference checking software provider, Xref, certainly points to a concerning trend. Of those job seekers surveyed, 71% admitted to exploiting flaws within the reference checking process to secure a job. The most common superfluities were: deliberately lying to a potential employer (42%) and actively encouraging a referee to bend the truth (23%). It seems it’s a growing trend. According to the Risk Advisory Group’s 2017 analysis of a cohort of 5,000 CVs, 80% contained one or more discrepancy – an increase of 10% compared to 2016. If we consider this against the increasing number of roles a candidate is vying for, the case for automating your background screening process is compelling. The latest quarterly CIPD Labour Market Outlook (LMO), reveals that although job vacancies remain above historical average levels, the strong demand for labour is not being met by supply. Of the 2,001 employers surveyed, 53% report finding it difficult to fill vacancies. This challenging outlook is backed up by the Recruitment and Employment Confederation’s latest JobsOutlook report, where half of UK employers expressed concern over sufficient availability of candidates for permanent jobs. And the UK is not alone. Over 50% of EMEA businesses claim that finding talent remains their biggest business challenge for 2018, according to international employment screening software provider, HireRight’s 2018 EMEA Employment Screening Benchmark Report. Today’s businesses can ill-afford lengthy background checks. Yet research from Robert Half UK indicates that HR directors spend up to 28 days on the recruitment process, with 5.19 days spent solely on reference checking! Those 5 days significantly increase the risk of the ideal candidate accepting an offer elsewhere. More to the point, candidates expect a seamless recruitment experience. Every candidate touch-point defines their experience of you as an organisation. The referencing and screening stages are no exception. A study by Glassdoor, not surprisingly, found candidates “want information from both employees and the employer to make the best job decision possible and will actively be seeking out this information.” A company that swiftly conducts all background checks electronically will give a better impression to the candidate than one that that asks them to go through the convoluted paper process! The Digital identification revolution is already here. Well, almost! Take new app Yoti – Your Own Trusted Identity – launched in November 2017. It enables customers to leave their passports and driving licenses at home by uploading them to a secure app. Yoti has already seen more than one million downloads and is set to grow now that Governments are fully embracing it. Earlier this month, the Scottish Government became the app’s latest partnering governing authority. It’s not the only company trying to convert identification documents in digital versions either. The DVLA has been working on developing a smartphone driving licence. And Microsoft has also revealed it is exploring using blockchain to prove identification. Meanwhile, trials of the Home Office’s new digital codes for EU citizens to demonstrate their ‘settlement status’ start this week as part of the Government’s post-Brexit plans. The Home Office intends on making the settled status process as paperless as possible. Successful applicants will be issued with digital codes that employers enter into a digital platform to confirm an applicant’s immigration status. Whilst we await the findings from the pilot, the Home Office has published a toolkit for employers to support the EU Settlement Scheme. It has never been more important for HR teams to ensure that their recruitment practices are digitally optimised. After all, HR systems could, in the not so distant future, be integrated to request digital identity and reference check information at the click of a button for a suitable candidate. The time to hire would be massively reduced and productivity increased. The ease of integration will very much depend on how far, as an organisation, you’ve already embraced automating your HR systems. As Karen Kaur, immigration analyst at Migrate UK, told People Management recently, although most employers are confident at handling digital records, “you do get some places where it is mainly paper based”. This could make implementing a Home Office app-based system difficult. There is lots of talk of Millennials of late, yet of all the generations, Generation Z (those up to the age of 22) will be the most accepting of digital identification and automated reference checking. They’ll almost expect it. Gen Z, also referred to as ‘iGen’ is already replacing millennials as a young workforce. Some are starting to leave education and apply for jobs. They do not know a world without digital devices, internet or social media. As such, they know exactly how to use this kind of technology for virtually every aspect of their lives. And they, understandably, expect the recruitment process to emulate the digital world they are attuned to. This is exactly why large companies such as McDonald’s and Goldman Sachs are using Snapchat to recruit Generation Z candidates. Looking behind the scenes, we are also seeing greater collaboration between social media and pioneers of technology automating the background screening process. Interestingly, Snap, the parent company of Snapchat, is already working with Xref to address some of the problems it had in conducting reference checks on graduates and technical talent, by streamlining its reference checking process. With such a rapidly evolving workforce, there’s a myriad of software solutions to choose from. These range from automated email questionnaires with built-in reminders, through to those underpinned by artificial intelligence (AI). Xref, for instance, uses an algorithm to review the way sentences are constructed. It cleverly strips out basic conjunctions, focusing instead on the relevancy of the answers to the questions you’ve asked a referee. At a glance, you can review positive, negative and neutral comments made about a candidate. Web-based talent decision tools software developer, Checkster, uses what it calls “collective intelligence”. There are several stages. The Automated Reference Checkup assesses talent pre-hire by upgrading the traditional telephone reference check. The Interview Checkup gives interview debriefs to the hiring manager, whilst the 360 Checkup and Assessment validates the quality of a new hire. Candidates still supply the email address details for references who then answer a set of questions. But completion rates, Outmatch report, are around 82% for automated reference checks, compared to 30% for phone-based ones. What we’re witnessing then, is not the extraction of the ‘human’ from human resources, but another example of where data intelligence can be used as evidence to quickly acquire the right talent. To learn more about what your options are in automating the reference checking process or to discover the benefits of investing in HR technology, please get in touch or request a call back today.